A new otome game is out from our proud series “Shall we date?” with 3 million downloads worldwide: “Shall we date? : Scarlet Fate —Fragments of the past—”. 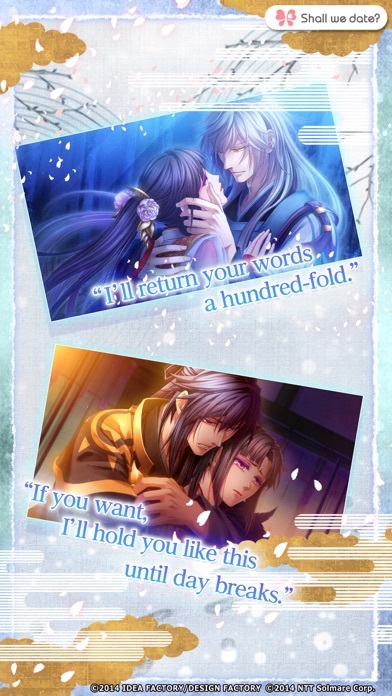 Scarlet fate —Fragments of the past—(original title Shirahana no Ori —Hiiro no Kakera 4) is one of the many successful games produced by the famous dating Sim game brand “Otomate” from Idea Factory. The Shall we date? Team is proud to announce the result of this new collaboration. 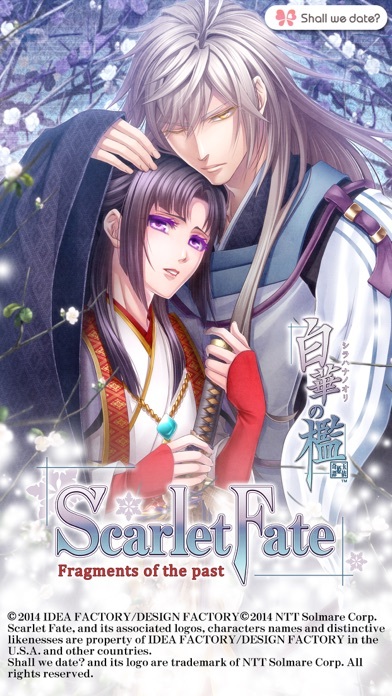 “ Scarlet fate”, an original story featuring exquisite illustrations , is now available on mobile platform for the first time in English! 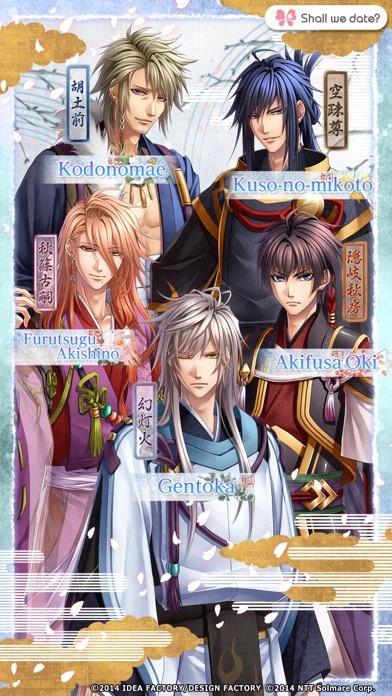 1.Story Introduction Set against the backdrop of the Heian period (ca. AD 1000) in Japan...In a sacred, snow-covered village is kept a sword with the power to bring the world to an end. One young maiden of a shrine is fated to seal the Sword’s power and protect it: Princess Tamayori. She has spent her days since childhood being tormented by her sins in loneliness and under the heavy burden of protecting the Sword so that its power would not be released. ...Until one night when she encounters a wounded god and her lonely life changes forever; she will face the end of the world with comrades willing to help her. She fights to prevent the demise risking her own life, but she begins to waver between her resolve and her wish to live for the one that she loves... Will there be a future for those who bear sins? In this snow-fluttering world, the tale of the ancient Princess Tamayori unfolds. 2.Characters Akifusa Oki : A serious officer who attends on Princess Tamayori “I want to be stronger to protect you.” Gentoka : A god who pledges his allegiance to Princess Tamayori “My life belongs to you. You can use it as you like, Princess Tamayori.” Kuso-no-mikoto : Princess Tamayori's fiance who is a sarcastic god “What a sassy girl! 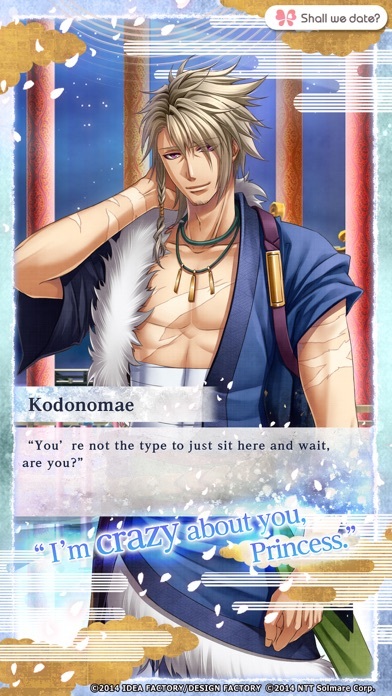 You don't deserve to be my wife.” Kodonomae : A god who excels in the art of war “Why don't you smile? Everyone likes your smile.” Furutsugu Akishino : A chief of security with an alluring air about him “Who can refuse a request from such a beautiful princess?” 3. 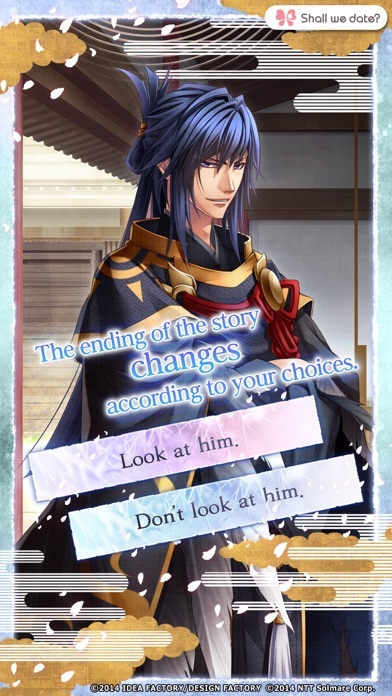 In This App, You Can: 1)Enjoy spending time with good-looking characters with exceptional physical abilities involved in the story. 2)Enjoy multiple ending stories where every choice you make counts. 3)Collect around 40 photos per character by reading the whole story and all the endings.